Ans. Firm determination and hard work is required for execution of every task. 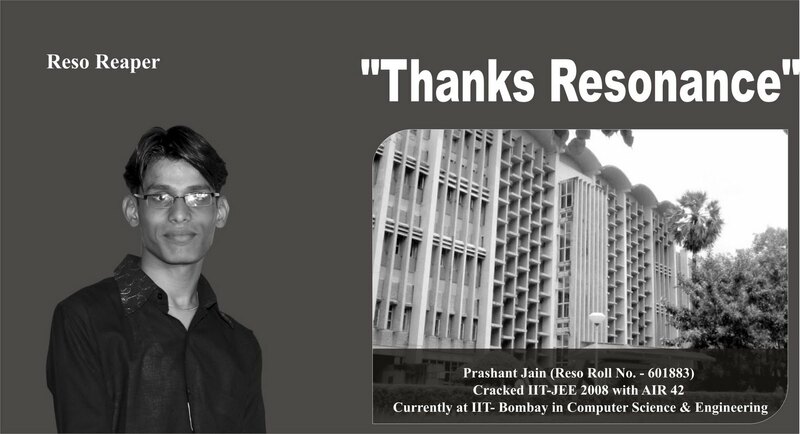 I worked sincerely and made a room for me in IIT with flying colors. Q. What was your order of preparation – class notes, personal notes or DPPs? How did you utilize your study hours to get maximum coverage of syllabus? Ans. The Reso teachers are better guides to answer this question. Proper and continuous practice of DPPs & modules is the key to success in IIT-JEE, while revising the whole syllabus in the last few days. As one can’t go through the whole of it, revision planner really works in such situation. It helped me also in choosing the questions which covered most of my course. Q. While preparing for IIT-JEE, where one should emphasize more- on problem solving or on understanding the subject? Ans. This is a tricky question. If u want your life to be a bit easy in IITs, then understanding the subject is necessary. Even Olympiad aspirants have to understand the subject. JEE can be cleared by more and more practice but u can maximize your result if u have done both the tasks sincerely. Q. How does one cope up with the school syllabus and preparation for the IIT-JEE? Ans. I used to cover the whole school syllabus side by side which proved beneficial for me in boards. I would suggest my juniors not to leave JEE preparation during Boards because it may kill your objective skills. Try to study both simultaneously. Q.How important is emotional quotient in preparation for IIT-JEE. Please explain? Ans. Emotional quotient is one of the factors that can alter your performance at JEE. So have faith in yourself because you have done all the hard work in these 2/3 years and you can’t let it go in 6 hrs of JEE. Q. How did you refresh yourself from the hectic schedule? Ans. I used to play games in school for refreshing and cycling which I could afford being a localite. listening music, watching movies on test days can be a better option, BUT DO NOT GET ADDICTED TO THEM, and always do one work at a time either studies or enjoyment. Q. While preparing at Resonance how did you evaluate your performance after each CT, APT & JPT? Ans. CT was the major evaluator of my performance at Resonance. I used to analyze my result and areas where I did maximum mistakes. Then I worked hard to improve on. These are the tests in which u can experiment your approach but try to get set with your approach and apply the same in JPT and even in JEE. Q. How did you manage the final revision of the whole syllabus of IIT JEE in last few days? Ans. I used to make brief notes of all the important formulas and concepts in one separate copy of all the 3 subjects and I used to revise it before tests and JEE but cumulative effect is most important u cant do much in last few days that’s why one has to make a habit of studying on daily basis. Q. To whom you wish to give the credit of your success? Ans. My parents and family always had faith in me. They supported my decision of choosing Resonance. Besides them my Resonance teachers, my school teachers and my friends and last but not the least myself, hold the credit for this achievement. Q. What is your Success mantra? 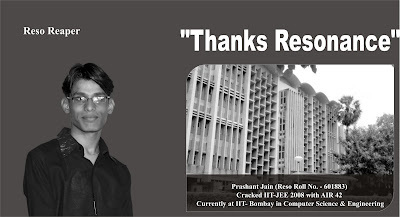 Give some advice to your successors at Resonance who are preparing for IIT-JEE?